In windows XP we can’t change the Task-bar Position. 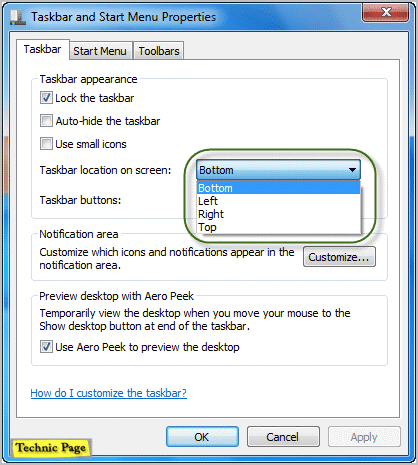 Windows 7 has an option to change the Task-bar position. We can change its position on screen to Left, Right, Top and Bottom. Taskbar In Top Of The Screen. Right click on the Taskbar and select the Properties option. Now you will see the Taskbar properties window. Select the Taskbar location on screen to Top, Left, Right what ever you want. Press the Apply button to save the settings. You can change its position by simply dragging taskbar to top, right, left. But you must unlock the taskbar to enable dragging. 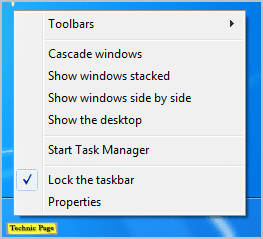 You can Unlock the taskbar by removing the tick to Lock the taskbar in taskbar properties window.